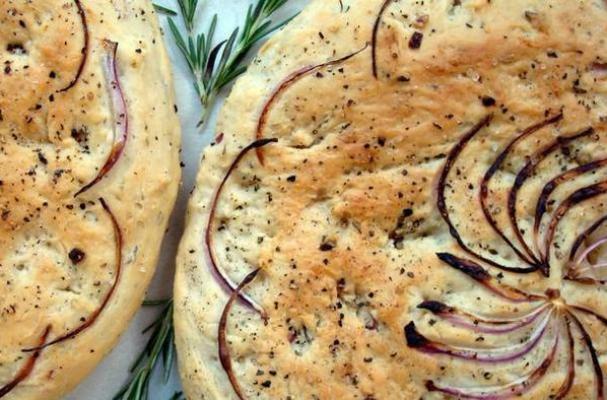 Caramelized red onion and hearty rosemary infuse fluffy focaccia with intense flavor in this amazing winter bread recipe. Focaccia is already delicious with a simple topping of olive oil and sea salt, but you should really experience the addition of lemon zest, fresh rosemary sprigs and delicate red onion slices. Black pepper adds a touch of heat and extra depth. Pour the warm water and honey into the bowl of your electric mixer with a paddle attachment. Add one package of dry active yeast and swirl around. Allow the yeast to foam for 10 minutes or so. Then add the cold water, lemon zest, 2 Tb. oil, salt, rosemary and onions. Turn the mixer on low and slowly add the flour. Once all the flour is in the bowl, switch the paddle to the bread hook attachment. “Knead” on low for about 10 minutes. Pull the dough away from the sides and rub the bowl down with oil. Cover the bowl with plastic wrap and allow the dough to rise for 1 ½ to 2 hours. Remove the plastic wrap and turn the mixer back on for 30 seconds. Divide the dough into two pieces and press with your fingers into two 9-10 inch round pans. As you press to dough to the edges, don’t be afraid to let your fingers puncture the dough — this will create the bumpy, rustic texture of traditional focaccia. Cover both pans with a clean, damp towel. Allow the dough to rise again for another 2 hours. Preheat the oven to 400* F. Before baking use the remaining tablespoon of oil and brush the tops of the loaves. Sprinkle with salt and pepper and decorate with thin onion slices, if you like. Bake for 25-30 minutes, until the tops are golden-brown. Turn out the bread loaves and ENJOY!